A most tasteful and refined late Georgian period grade II listed townhouse with a secluded south-west facing side garden and south-east raised mediterranean style terrace. Elegant and civilised accommodation laid out over four floors - three primary bedrooms including a stunning master on the top floor - a cosy sitting room, bright study and a kitchen/dining room. 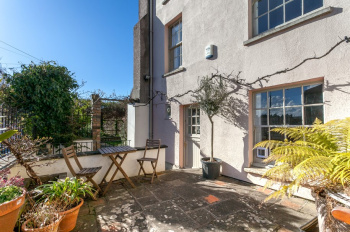 Set in the vibrant heart of Montpelier close to Picton Street/Cheltenham and Gloucester Road with a wide range of independent shops, cafes, restaurants on the doorstep. Good transport links - within a few hundred yards of a rail link to Clifton, Redland and Bristol Temple Meads and a useful bus network on Cheltenham Road.